The End of Hot Docs 2012 also brings the end of the Cumberland Four as a cinema. Opened in 1981, the Cumberland provided the upscale Yorkville section of Toronto with the latest art house gems for many years, confident in letting other theaters like the still missed Uptown cover the bigger titles and garner all the acclaim. The Cumberland seemed content to be the little theater flying under the radar to most, but well cherished by those in the know. I’m going to keep these musings brief, as everyone else has done their history piece, I’ll be focusing mainly on my experiences at the Cumberland. 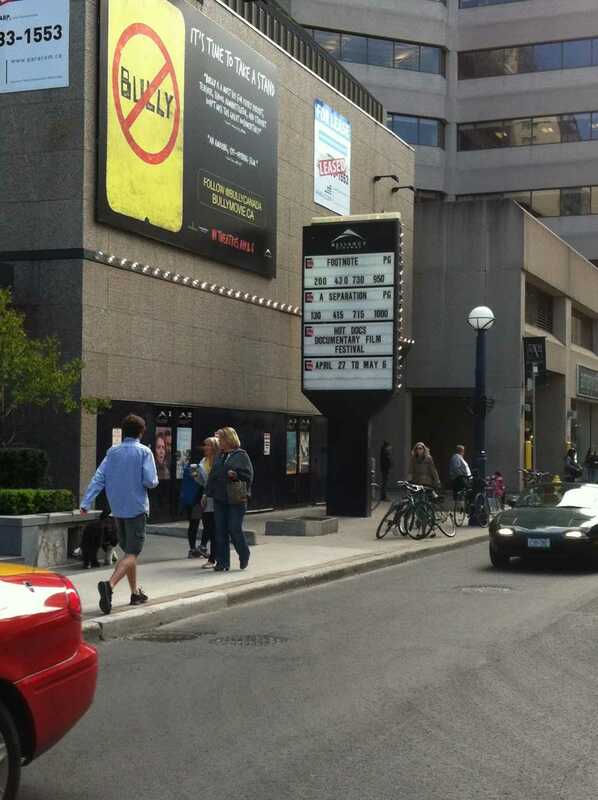 I still love the little walkway from Bloor Street through to the theater box office aligned with movie posters above. 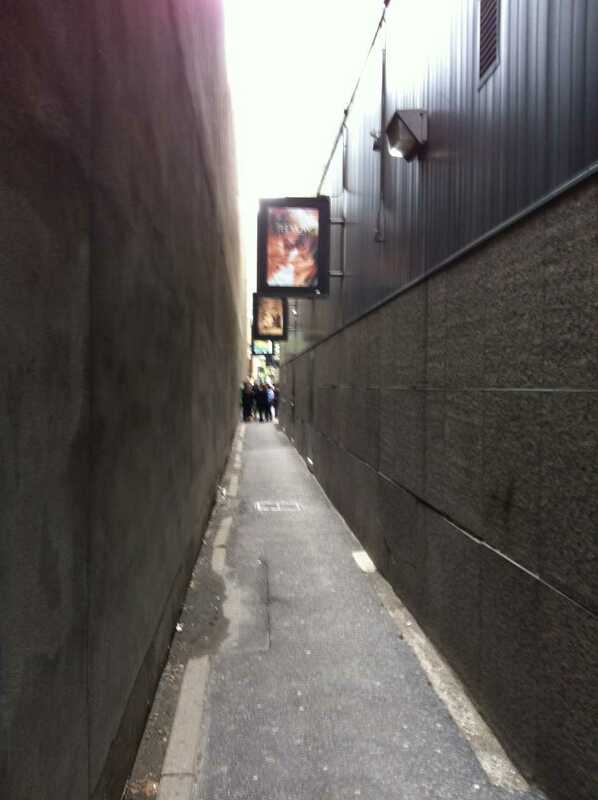 I remember quite a few Rush lines standing in that alley for TIFF screenings. Watching films like the Spireg Brothers’ Undead, Anders Morgenthaler’s Princess and the Korean comedy Save the Green Planet from Joon-Hwan Jang, all repeat screenings from the insanity that is Midnight Madness. I can also remember being the first person denied entrance from the rush line for the seminal Ong Bak (Ed: ouch). I will never forget the myriad of snacking choices during the fest, I’m sure they inspired other theaters like the newly renovated Bloor cinema to get more creative with their choices as well. Over the years TIFF started to use the Cumberland for less screenings, especially after the launch of the Lightbox, so I had fewer opportunities to visit during the fest. Upon hearing the Cumberland’s fate I was certainly thankful to Hot Docs for allowing me to visit the old confines one more time. My last experience was the thoroughly enjoyable and delightful Radioman, complete with Q&A via IPhone, a wonderful last experience. 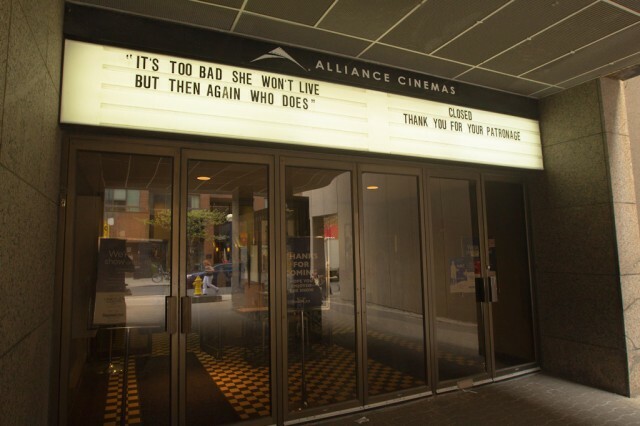 The Blade Runner quote “It’s too bad she won’t live, but then again who does” now adorns the marquee along with a thanks from the staff. Ultimately the Cumberland was victim to an over competitive marketplace in Toronto, with so many rep theaters thriving and the return of the newly renovated Bloor Cinema, the bubble had to burst on the scene at some point. I for one hope the Cumberland is it’s only victim, but fear that it won’t be the last. So the Cumberland will become a high end retail store and Café, perfectly suited for the Yorkville clientele, making the theater space unrecognizable. Perhaps this is for the best as the hardest part about losing the Uptown was how long it sat empty and unchanged before anything happened, a constant reminder of its former glory. Farewell Cumberland, we’ll always have Tony Jaa. Make sure to keep up with all the goings on at Entertainment Maven by liking our Facebook page and having updates deliver right to your Facebook News Feed. It’s the only way to stay on top of all of our articles, including the last of our Hot Docs 2012 coverage and the upcoming films and festivals in Toronto.